Project born from art’s encounter with the world of incarceration, curated by Zerynthia Associazione per l’Arte Contemporanea OdV with the non-profit organisation Fondazione Casa dello Spirito e delle arti. 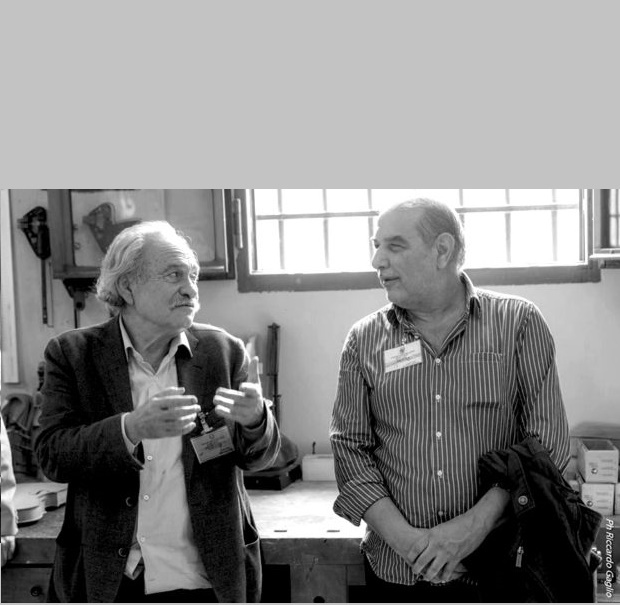 The great artist Jannis Kounellis, who passed away on 16th February 2017, by invitation of warden Giacinto Siciliano, had personally visited the Luthier’s workshop in the Opera Prison in Milan, accompanied by Maestro Carlo Crivelli, by gallerist Mario Pieroni and Arnoldo Mosca Mondadori. Inspired by this encounter, he conceived one of his last works, using precisely one of the violins made by the inmates, to be subsequently donated to the Fondazione Casa dello Spirito e delle arti, creator of the Luthier project. The art piece will be exhibited in Sala Binario- Frigoriferi Milanesi. In the meeting, enriched by the testimonies of Carlo Crivelli, Damiano Kounellis, Arnoldo Mosca Mondadori, Daniele Pieroni, Mario Pieroni and Giacinto Siciliano, will be presented the volume which documents the entire project. The book, Di Paolo Edizioni, contains the poster of Kounellis work, Crivelli’s score about the artist and a poem’s work by Daniele Pieroni. The book will be distributed in prisons in Italy and worldwide, as well as in schools and cultural centers. Following it will be the world premiere of the composition by Maestro Carlo Crivelli: Il Violino di Kounellis (The Kounellis Violin), for 4 violins and string orchestra of the Bruno Maderna Conservatory in Cesena. In the month of December the Violin will be presented at the Opera Prison and will then go on to prisons in Barcelona and Athens, the first venues of the Violin’s itinerary. The event is part of the project Oltre la Rete / Over the Net and is realized thanks to the contribution of Fondazione Cariplo, Di Paolo Edizioni and Tipografia Mancini. Sentieri Contemporanei / Contemporary Path Bookshop: our books now available on Amazon!